Abortives are medicines and therapies that can stop or shorten an attack once it has begun. Abortive therapies are intended to do just that – abort the attack at its onset and stop the pain. One of the most critical factors in effectively aborting a cluster headache is getting the medicine to the problem, fast. Since cluster headaches come on rapidly and are of relatively short duration, medicines taken in pill form are generally not effective. The route of administration of the drug should introduce the medicine to the bloodstream fairly immediately, therefore, medicine by injection or inhalation will provide the highest likelihood of an effective and rapid abort. High-flow oxygen is a godsend for the cluster headache sufferer. It is a risk-free, natural alternative that is highly effective as an abortive for most cluster headache patients. 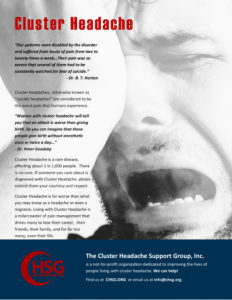 It is easy to acquire and easy to use to abort cluster headaches; however, for whatever reason, many doctors are reluctant to prescribe its use. One of the first things you should do when diagnosed with cluster headaches is request a prescription for Oxygen in the home at 12-15 liters per minute (lpm) with a non-re-breather mask. You may get some pushback, but providing some study data may help. It’s a good idea to print out the study documents found here to take with you to the doctor. A nasal cannula at low flow will not work to abort cluster headaches; the concept is to breath as close to 100% pure oxygen as is possible. A deeper description of why this works may be found here. Oxygen therapy has literally changed hundreds of people’s lives. In 2006 the Food and Drug Administration (FDA) issued an alert, based on 27 case reports gathered over a 5-year span, regarding serotonin syndrome resulting from concurrent use of either a selective serotonin-re uptake inhibitor (SSRI) or a selective serotonin/norepinephrine reuptake inhibitor (SNRI) with a triptan. To understand a possible role for transient potential receptor vanilloid 1 (TRPV1) ion channels in sumatriptan relief of pain mediated by trigeminal nociceptors.